When this 2000 Boxster was purchased new, the owner likely never imagined their 2.7-liter base model would one day become a twin-turbocharged track monster. The mind of Bisi Ezerioha is an incredible thing, because he and his crew continue to build seriously impressive machines, building crazy power with unorthodox methods. There is very little in this Boxster that remains stock Boxster, as it's been stripped down to minimum weight with a serious carbon fiber diet, including a set of 19" Carbon Revolution wheels in 997 GT3 sizes. We know that GT3-sized wheels won't fit on a 986 without fender flares, because we've done it. This car was built for SEMA last year, and fender flares are all the rage there anyhow, so why not? With a carbon fiber roof, a giant wing out back, and a huge splitter on the front, this Porsche is ready to hit the track with a bunch of downforce. Obviously it no longer looks like a 986 Boxster with the complete 997 GT3 front end swap, which is actually pretty slick if you ask me. 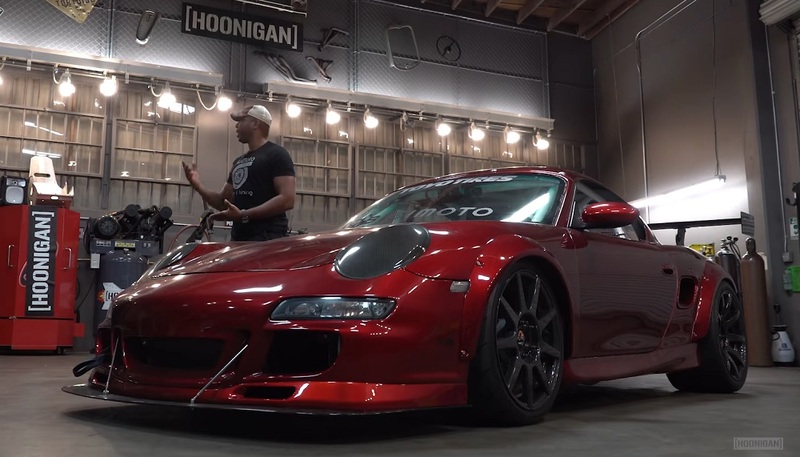 Check out the full build details in the Hoonigan-produced Build Biology video below. There are really two mega wild components of this project that stick out to anyone who spends a few minutes looking at it. The first being the turbocharged engine, with exposed turbos sticking out of the rear bumper of the Boxster. The second is the Porsche's incredibly engineered center seat that allows for perfect corner weighting, no matter who is driving. That engine, still a 2.7-liter unit, features a wild air-to-water-to-air intercooler setup in the rear trunk, runs on a giant tank of E85 mounted up front to produce a metric ton of boosted power, and it makes this lightweight Boxster scream like bloody murder. If that wasn't enough, Bisimoto plans to drop a 3.4-liter 996 motor in the middle of this thing, still with the same twin turbochargers, to really pump up the power. All of that power magic is felt from the mid-mounted driver's seat. Obviously, without a driveline tunnel in the Boxster, the seat can really be mounted wherever you want once the full interior is stripped out. The shifter is cable-operated, so as long as you move the full shifter assembly, it doesn't really matter where it is mounted. Take a seat, move the pedals and the steering wheel where you want it, and you're on your way, perfectly corner balanced for the next track day. Perhaps the best part of this center seat Boxster is that it is used as it was intended to be. Obviously it had to be pretty for SEMA, but since then, it's been to six different track test days to work out the bugs and make it as fast as possible. Clearly Bisi has an awesome supercar track monster that is built on base model bones, and that's the best way for this Boxster to live out its life. It has reached its true potential.